"We Make Your World More Convenient" — There is no "Away"
Did you mean to drop that? "We Make Your World More Convenient"
That's the company quote on the homepage of Dart, "manufacturing quality single-use foodservice products worldwide". Thanks Dart. Thanks a whooooooooole bunch. 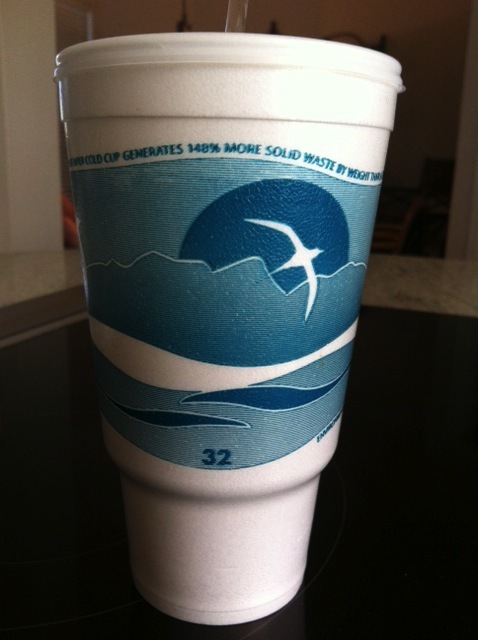 My mother in law (Texas) sent me this photo of a styrofoam cup she was given at a local restaurant, the Silver Spoon. She was a little baffled as to why her drink was served in styrofoam when other patrons had beverages in glasses. Nonetheless, the text that wraps around this cup reads: "An average weight paper cold cup generates 148% more solid waste by weight than a comparable foam cup." And fittingly, this quote is featured above a graphic of a seabird flying over the ocean. Ironic, no? Sure, paper weighs more than styrofoam - totally true. What they neglect to mention, is that while paper products will eventually break down, get recycled, or composted (leaving out paper that languishes in anaerobic landfills - that's another conversation), their super lightweight styrofoam does not. In fact, their product is so light, it's very easily blown "away" and into storm drains and gutters heading off to join the rest of the plastic bits in our oceans. I'd wager that you yourself have seen packing peanuts blowing around on the streets! This type of manipulative greenwashing sinks pretty low - It seeks to make an entirely unsustainable product seem "eco" by slapping a nonsensical statement, paired with a reassuring graphic on their product. Justifying their saying that a paper cup generates more solid waste BY WEIGHT (key words) than a foam cup, is like saying that burritos generate more solid waste by weight than cotton candy. Therefore cotton candy is better. 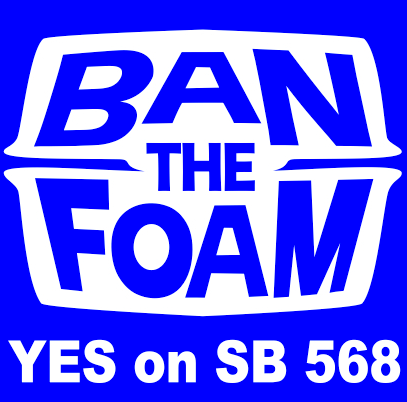 September 18, 2013 - Surfrider reports that El Cerrito finalized two ordinances (passing the bag ban, AND one that bans polystyrene food containers at restaurants) - Congrats and Thanks to the progressive minds in El Cerrito!